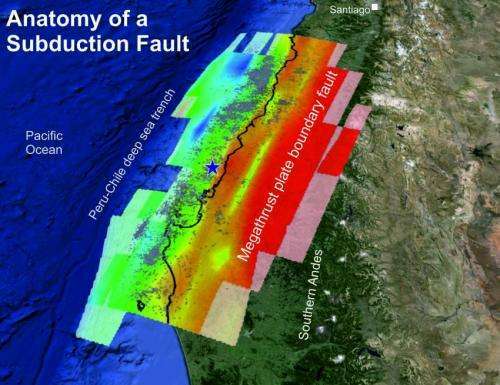 Researchers from the University of Liverpool have found an unusual mass of rock deep in the active fault line beneath Chile which influenced the rupture size of a massive earthquake that struck the region in 2010. The geological structure, which was not previously known about, is unusually dense and large for this depth in the Earth's crust. 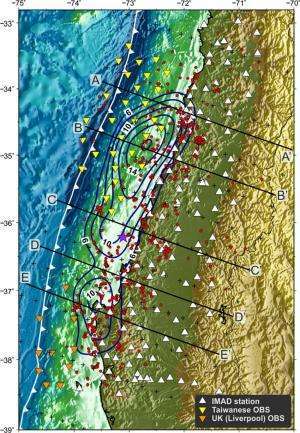 The body was revealed using 3-D seismic images of Earth's interior based on the monitoring of vibrations on the Pacific seafloor caused by aftershocks from the magnitude 8.8 Chile earthquake. This imaging works in a similar way to CT scans that are used in hospitals. Analysis of the 2010 earthquake also revealed that this structure played a key role in the movement of the fault, causing the rupture to suddenly slow down. Seismologists think that the block of rock was once part of Earth's mantle and may have formed around 220 million years ago, during the period of time known as the Triassic. Liverpool Seismologist, Stephen Hicks from the School of Environmental Sciences, who led the research, said: "It was previously thought that dense geological bodies in an active fault zone may cause more movement of the fault during an earthquake." "However, our research suggests that these blocks of rock may in fact cause the earthquake rupture to suddenly slow down. But this slowing down can generate stronger shaking at the surface, which is more damaging to man-made structures." "It is now clear that ancient geology plays a big role in the generation of future earthquakes and their subsequent aftershocks." Professor Andreas Rietbrock, head of the Earthquake Seismology and Geodynamics research group added: "This work has clearly shown the potential of 3D 'seismic' images to further our understanding of the earthquake rupture process. We are currently establishing the Liverpool Earth Observatory (LEO), which will allow us together with our international partners, to carry out similar studies in other tectonically active regions such as northern Chile, Indonesia, New Zealand and the northwest coast United States. This work is vital for understanding risk exposure in these countries from both ground shaking and tsunamis." Chile is located on the Pacific Ring of Fire, where the sinking of tectonic plates generates many of the world's largest earthquakes. The 2010 magnitude 8.8 earthquake in Chile is one of the best-recorded earthquakes, giving seismologists the best insight to date into the ruptures of mega-quakes. The research is published in the journal Earth and Planetary Science Letters.